Widely Used: applicable in bank, insurance business, real estate agency, home, office, library or outdoors. Suitable for lawyer-legal volume, doctor-medical case of illness, student-class notes, accountant-financial report cover, bank-voucher documents, business man-correspondence. 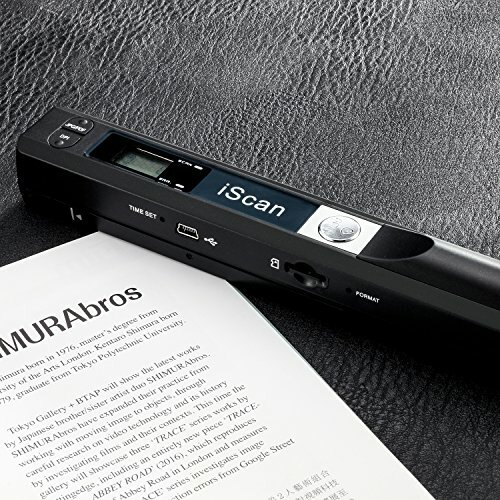 Portable scanner can change to PDF files or JPEG. Lightweight and travel-friendly : the portability you need to capture data while on the road. Stored in Micro SD card directly. Portable scanners for documents support read data on your computer or phone with USB connected. Powered by 2pcs AA batteries, Compact Design, convenient to carry outside. Resolution: Standard Resolution: 300x300dpi (default); Medium Resolution: 600x600dpi; High Resolution: 900x900dpi. Pictures and documents are showed clear as it is. Freely choose your favorite resolution on document scanner. Scans images or pictures quickly: Store JPEG/PDF files within seconds, scan images or pictures quickly, plug and play, no need any software preinstalled. Document scanner compatible with Windows XP/7/Vista/Mac OS 10.4 or above version. Portable Scanner: Slide your scanner into the drawstring pouch, which slips conveniently into a purse or briefcase so you can scan important documents and photos on-the-go when no copier is available. It is a manual portable scanner.